Kyoto is one of the most popular cities in Japan. When you explore the historical city you probably will have to stay somewhere. What if I told you that you can expand your historical experience by staying at a machiya (a traditional wooden house) and do some good for animal welfare at the same time? If you stay at Maneki Machiya, you will have a machiya guesthouse all to yourself, enjoy the quiet local neighborhood and the proceeds from your room fee will go towards helping Japans stray cats. Machiya are traditional Japanese wooden townhouses with tile roofs. They defined the cityscape of Kyoto until World War II. Most machiya stayed intact during the World War but due to the high costs involved in maintaining them, many of them were demolished by the owner one by one. After the damage was already done, it became obvious that Kyoto's cityscape looked very different without them. Local groups, with support of the government, have made it their goal to restore remaining machiya. They work together with the machiya's owners to maintain these designated "Structures of Scenic Importance". The restored machiya are protected and their demolition needs the permission of the mayor of Kyoto. The government does not only support the restoration but also the upkeep of these historical buildings. Maneki Machiya was founded by a lovely woman called Susan who is also responsible for the non-profit organization Japan Cat Network founded in 1993. Japan Cat Network (JCN) is a network where people help people to help animals. Their shelter capacity is very limited so they strongly encourage trap, neuter, return for feral cats and foster care for friendly cats. Being a non-profit organization, Japan Cat Network has purely survived on donations and volunteers. This made times especially difficult when the big Tohoku earthquake hit and they started to help and rescue the animals of Fukushima. Maneki Machiya began as a project with the aim of funding Japan Cat Network's animal welfare activities. The project now includes an event space, three licensed guest houses, and a volunteer program. Two new guest houses will soon be added, and a vegan cafe is in the planning stages. Maneki Machiya is also highly involved in taking care of the community cats. As of now, two feeding stations for the feral cats of the area belong to the Maneki Machiya complex. Most of the cats in the area are neutered and taken care of by the project. Why Staying at Maneki Machiya? When staying at a Maneki Machiya you can truly experience what it feels like living amongst the locals. Each charming little one-storied Machiya provides guests with a private living space and a garden. The kitchen is fully equipped with a fridge, a coffee maker, a microwave, cooking ware, and dishes. Towels, bedding, shampoo, conditioner, and body wash as well as some bagged tea and coffee is provided as well. All the machiya can accommodate three to four guests. However, if you book a guest house at Maneki Machiya, it is all yours. It is not like other guesthouses where you have to share the space with other guests. Staying here will feel like owning your own little house in Kyoto. Chairs and a table are provided in the small garden. You can enjoy your morning coffee or afternoon tea, or beer, outside. WiFi and bicycles to explore the city are also provided for free. Maneki Machiya is located near the center of Kyoto, so most popular places are accessible by bicycle. Maneki Machiya is located in the Uzumasa area, the same place the Toei Uzumasa Eigamura Studios are based. This neighborhood is known for being used as a backdrop for a couple of the studio's samurai movies, which truly adds to its historical charm. It is the perfect place if you prefer the quiet, more local site of Kyoto or for those who like to stay in unusual places when traveling. While Maneki Machiya owns six machiya, only three are licensed guest houses at the moment. These thee machiya can be book over airbnb. The most affordable guest house. A guest house with a simple, clean style. It can accommodate up to three guests. A double bed is standard but two single futon sets can be added. You can enjoy a view of the garden from the double bed. This guesthouse also accommodates up to three people. All people will be bedded on futons. The overall interior is very traditionally Japanese. Charming is Maneki Machiyas most popular guesthouse. It offers a queen sized bed and two extra futons to create enough resting space for up to four people. It is slightly shadowy which is perfect for summer. The interior is a mixture of classic and modern. The simplest way to reserve a room is by contacting Maneki Machiya directly via manekimachiya@gmail.com. As mentioned before you can also book a room via airbnb. The room price includes up to two people, any additional person will cost 1500 yen extra. The room price will depend on the time of the year so make sure to carefully check it at the time of your booking. Additionally to the room fee, you will have to pay a cleaning fee of 4500 yen as well as a security deposit. The security deposit will be paid back when you check out. Machiya are protected so please make sure to treat them nicely. Leave your shoes in the entrance and don't smoke inside. Animals are allowed in the house but please discuss the details beforehand. There are discounts if you want to stay longer than a week. The weekly discount is 10% and the monthly discount is 25%. Please email the address above if you have any further questions. If you love the historical site of Kyoto as well as supporting animals there is really no reason not to stay at Maneki Machiya. 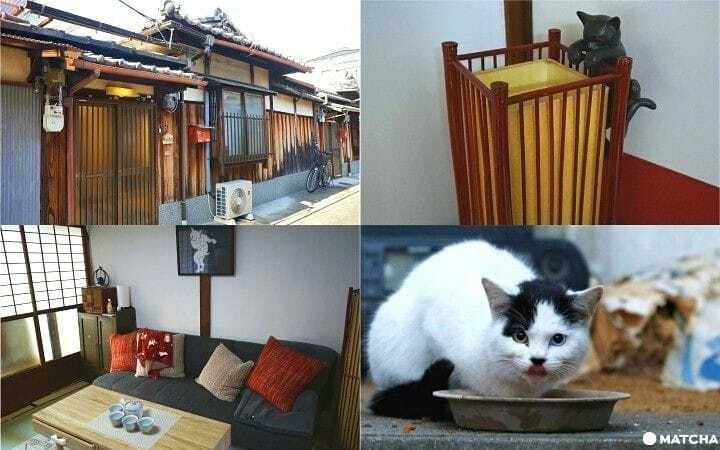 Not only can you stay at a historical machiya in Kyoto and enjoy the charming neighborhood, but you can also help raise money to care for homeless kitties. Maybe you will even make some new two or four-legged friends! If you can't come to Kyoto but still want to support Japan Cat Network, they are happy about any kind of food or money donations.